Vitiligo is a long-term condition where pale white patches develop on the skin. It's caused by the lack of melanin, a pigment in the skin. Vitiligo can affect any area of skin, but most commonly occurs on the face, neck and hands, and in skin creases. The pale areas of skin are more vulnerable to sunburn, so it's important to take extra care when in the sun and use a sunscreen with a high sun protection factor (SPF). It can also sometimes develop where there are hair roots, such as on your scalp. The lack of melanin in your skin can turn the hair in the affected area white or grey. Vitiligo often starts as a pale patch of skin that gradually turns completely white. The centre of a patch may be white, with pale skin around it. If there are blood vessels under the skin, the patch may be slightly pink, rather than white. The edges of the patch may be smooth or irregular. They're sometimes red and inflamed, or there's brownish discolouration (hyperpigmentation). Vitiligo doesn't cause discomfort to your skin, such as dryness, but the patches may occasionally be itchy. The condition varies from person to person. Some people only get a few small, white patches, but others get bigger white patches that join up across large areas of their skin. There's no way of predicting how much skin will be affected. The white patches are usually permanent. In rare cases, it's possible for vitiligo to affect your whole body. This is known as universal or complete vitiligo. 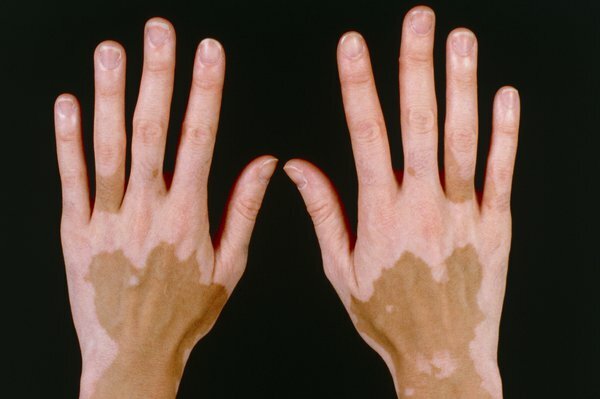 In non-segmental vitiligo (also called bilateral or generalised vitiligo), the symptoms often appear on both sides of your body as symmetrical white patches. Non-segmental vitiligo is the most common type of vitiligo, affecting around 9 out of 10 people with the condition. In segmental vitiligo (also known as unilateral or localised vitiligo), the white patches only affect one area of your body. Segmental vitiligo is less common than non-segmental vitiligo, although it's more common in children. It usually starts earlier and affects 3 in 10 children with vitiligo. Vitiligo is caused by the lack of a pigment called melanin in the skin. Melanin is produced by skin cells called melanocytes, and it gives your skin its colour. In vitiligo, there aren't enough working melanocytes to produce enough melanin in your skin. This causes white patches to develop on your skin or hair. It's not clear exactly why the melanocytes disappear from the affected areas of skin. Non-segmental vitiligo (the most common type) is thought to be an autoimmune condition. In autoimmune conditions, the immune system doesn't work properly. Instead of attacking foreign cells, such as viruses, your immune system attacks your body's healthy cells and tissue. If you have non-segmental vitiligo, your immune system destroys the melanocyte skin cells that make melanin. Vitiligo is also associated with other autoimmune conditions, such as hyperthyroidism (an overactive thyroid gland), but not everyone with vitiligo will develop these conditions. Segmental vitiligo (the less common type) is thought to be caused by chemicals released from the nerve endings in your skin. These chemicals are poisonous to the melanocyte skin cells. Vitiligo isn't caused by an infection and you can't catch it from someone else who has it. Your GP will be able to diagnose vitiligo after examining the affected areas of skin. 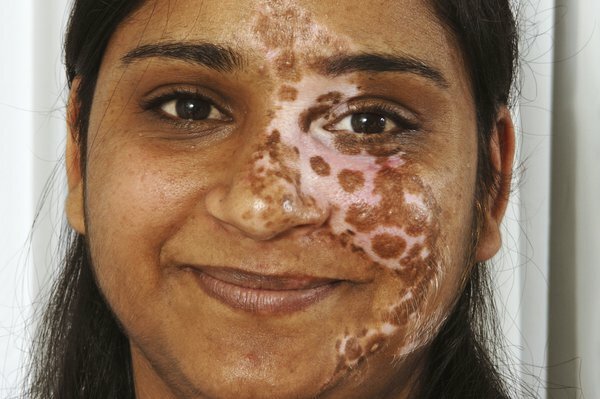 Your GP may also ask you about the impact vitiligo has on your life. For example, how much it affects your confidence and self-esteem, and whether it affects your job. If available, your GP may use an ultraviolet (UV) lamp called a Wood's lamp to look at your skin in more detail. You'll need to be in a dark room and the lamp will be held 10 to 13cm (4 to 5in) away from your skin. The patches of vitiligo will be easier to see under the UV light, which will help your GP distinguish vitiligo from other skin conditions, such as pityriasis versicolor (where there's a loss of pigment due to a fungal infection). A blood test may also be needed to check how well your thyroid gland is functioning. The white patches caused by vitiligo are usually permanent, although treatment options are available to improve the appearance of your skin. If the patches are relatively small, skin camouflage cream can be used to cover them up. In general, combination treatments, such as phototherapy (treatment with light) and medication, give the best results. Although treatment may help restore colour to your skin, the effect doesn't usually last. Treatment can't stop the condition spreading. Read more about treating vitiligo. Vitiligo can sometimes cause other problems. Because of a lack of melanin, your skin will be more vulnerable to the effects of the sun. Make sure you use a strong sunscreen to avoid sunburn. Vitiligo may also be associated with problems with your eyes, such as inflammation of the iris (iritis), and a partial loss of hearing (hypoacusis). Problems with confidence and self-esteem are common in people with vitiligo, particularly if it affects areas of skin that are frequently exposed. Support groups can provide help and advice, and may be able to put you in contact with other people with vitiligo. Your GP may suggest a group in your local area, and charities such as The Vitiligo Society may also be able to help.